Last week was National Teen Driver Safety Week, which aims to raise awareness and seek solutions for preventable teen deaths and injuries on the road. With motor vehicle crashes being the leading cause of death for teens in the United States, we understand the importance of educating people about statistics and providing tips for developing safer driving habits. We actively took part in this week-long campaign in our classrooms as well as on our Facebook page, focusing on positive actions teens can take to be safe and keep their friends safe. Top Driver students got involved by making posters and starting conversations about important driver safety topics. 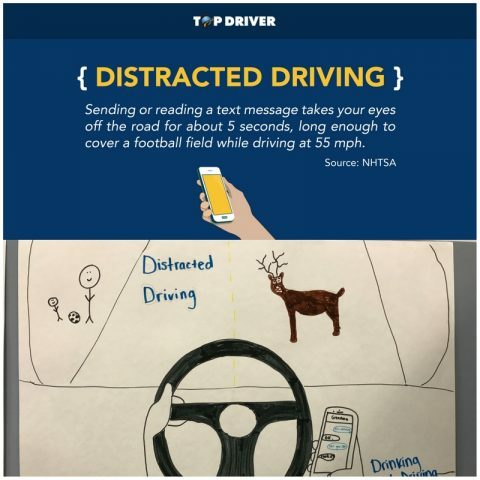 For example, our Libertyville and Western Springs students talked about distracted, impaired, and fatigued driving and then created posters to raise awareness of the dangers of each. Each day, we shared a driving statistic and a safety tip on our Facebook page. To see the posts, click here. We believe in the importance of educating students and the general public about common driving hazards. National Teen Driver Safety Week may only be from October 15th – 21st , but it is our hope that the conversations started during this week will continue and the safe driving tips learned will be used on the road. 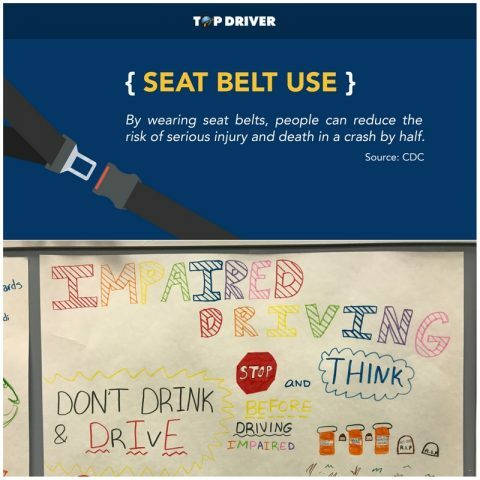 Here’s a few of the graphics we created for National Teen Driver Safety Week. Check out our Facebook page for more! This entry was posted in Top Driver Blog and tagged Driver Education, Driver Safety, Driving Tips, safe driving.